I am thrilled to be able to participate in this hop. 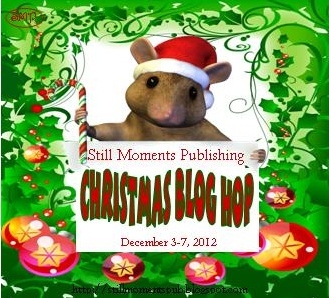 There will be lots of prizes available...many of the author blogs each day are doing their own giveaways but there are also grand prizes that will come from Still Moments Publishing. Click here for a list of the participating authors and the overall prizes !! 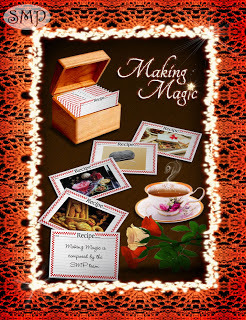 My prize is going to be a digital copy of SMP's Making Magic recipe collection to one lucky commenter. Just make sure you leave a comment below, including your email in case I need to contact you ! My favorite Christmas dinner is a Ham with all the trimmings. My husband is a Turkey man, or just a turkey but anyway, we save some of the leftover turkey from Thanksgiving so he's a happy camper and doesn't have to eat ham. My kids like all the finger food stuff. They'd be happy to take a plate to go while they're playing instead of sitting down at the table to eat a plate full of stuff they'd just rather not have. Mix and make into a ball. Refrigerate. Serve with crackers. Mix and refrigerate. Serve with fruit pieces. Hope you enjoy the recipes and thanks for stopping by today. Make sure you follow this link and hop on over to the other blogs ! Don't forget to leave your comment below and Happy Holidays !!! I will have to give the Fruit Dip recipe! Hi Liberty :) Thanks for stopping...I love recipes too ! Thanks so much for the yummy recipes! That cheese whiz recipe sounds good! Recipes are just in time.